23 halftones, 4 line drawings, 6 maps. Written in the newly recognized nonfiction genre of historical reconstruction, Who Killed Chester Pray? transports the reader to a last, grand hurrah of the American West. 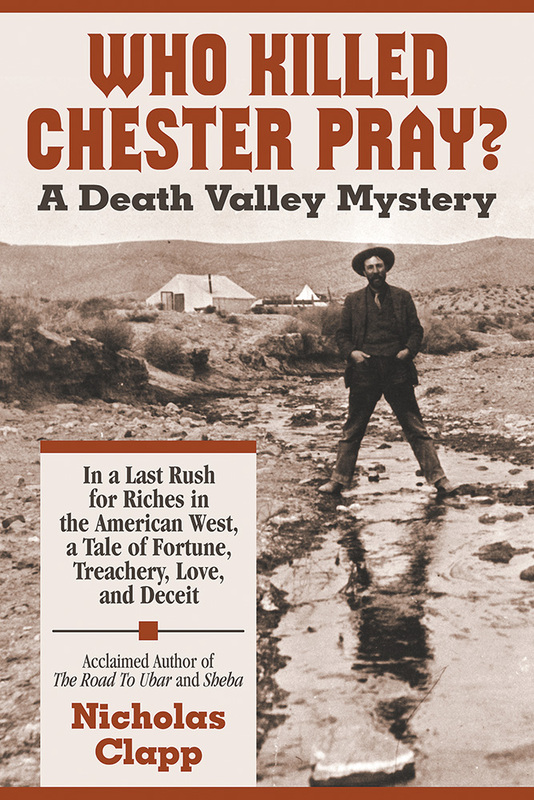 Seeking his fortune in the early 1900s, young prospector-assayer Chester Pray filched a Nevada sheriff's horses, stole gold belonging to a U.S. Senator, and ultimately discovered one of the richest lodes ever in Death Valley. Then, Pray was shot dead in the night. By who? Why? As many as seven individuals had ample cause to kill Chester Pray. His new partners? Gunslinger "Diamondfield Jack"? Even pretty Clara, his fiancáe? The psychologically compelling answer is not what you would expect. Nicholas Clapp, author, filmmaker, and amateur archaeologist, has been called by some "the real Indiana Jones." He has received more than seventy major film awards including Emmys and Academy Award nominations. His published works include the acclaimed The Road to Ubar and Sheba: Through the Desert in Search of the Legendary Queen.